It’s that time again. 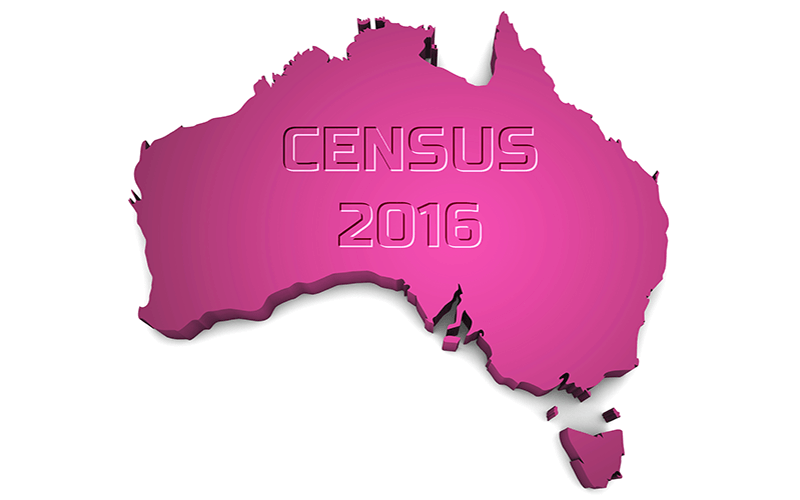 Time to complete the national census and be counted as part of the varying statistics that make up our country. I actually look forward to completing the census. What can I say, I’m a bit of a ‘form’ freak! And to be quite honest, I’m glad to be completing the Census this year online. Actually, from memory, I completed it online last time as well. Plus I refer to the ABS (Australian Bureau of Statistics) Statistics all the time during my property research. I find the information invaluable and can appreciate the importance of having accurate and reliable statistics. Every time there is always a bit of controversy about the Census… and this year is no different. Firstly there was the campaigns about recording a religion vs not recording a religion. Anti-Muslims didn’t want to be declared a Muslim country and thus encouraging everyone to not record a ‘non-religion’ answer, while the Atheist Foundations started their own campaign to actively get people to mark no-religion. I won’t bore you with the details but you can find information on this here, here and here. Now on face value this all seemed to me like blatant scare mongering. (My neighbour heard my thoughts loud and clear on this when he came over with a printed email displaying the same message wanting me to heed the message) Honestly, will people believe anything they read online?! And on top of this there is now fear that confidentiality will be breached, your information will be stored for years and used to track your every move. The fear of a security breach has been enough for some big names like Nick Xenophon and Anna Johnston declare they are boycotting the census. It can be so easy to say “Meh, I’ve got nothing to hide. Let them have my information” Which is usually my first response. But when Anna Johnston (Director of Salinger Privacy, and a former deputy privacy commissioner of NSW) says she is boycotting the Census because she’s concerned that her privacy will be breached, and former Australian statistician Bill McLennan saying the census was “without doubt the most significant invasion of privacy ever perpetrated on Australians by the ABS”, it’s not so easy to keep up the bravado. My long held support of the Census begins to waiver. When I think about the census I think about the critical data that is used to determine so many things in our country. The statistics alone for property tell such an important story and are the foundations on which important decisions are made. As I mentioned earlier, I alone have referred to ABS statistics on numerous occasions when making property decisions. As have thousands of other investors. You cannot get a more accurate snapshot of our country than the ABS statistic. But on the other hand, I do quite value my privacy as well. Should I be taking the risk to my privacy more seriously? I mean, how much actual risk are we talking here? Of course, I can’t give my neighbour a stern lecture about not believing everything he reads online, without giving myself the lecture as well. All this information I have to date is only what I have gathered from online news reports, social media and from the ABS website. Do I believe it? Should I believe it? Does the information ring true to me? Does the message come attached to an agenda? If I take a certain action based on this information, how will it affect the outcome? And does any action I take align with my core values? It’s a tough one. I mean the religious stuff I can instantly and easily dismiss. None of it rings true to me and each of those parties selling those messages have their own agenda that they are pushing… it’s a no brainer to me to call rubbish on that issue. The privacy issue however, not so easy to dismiss. The information is coming from seemingly reputable sources, and from the information provided, I understand why these people are choosing to boycott the Census. However, my core values include transparency and integrity, and I love being a part of a collective result. While I do also value my privacy, I believe the risk here is minimal and doesn’t outweigh the outcome of having strong, accurate statistics that everyone can draw from. So I’ll be taking the risk and completing the Census. What about you? Will you be part of the count or boycott to protect your privacy… what will you choose? Whatever you decide, I strongly encourage you, as I always do, to do your own research, weigh up the risks and benefits and come to your own conclusion. And when making your decision, remember, that it is actually compulsory to complete the Census. Meaning there may be consequences if you choose not to complete it.